Breakfast is possibly my favourite meal of the day. I’ve described before my love of waking up after the enforced fast of a good night’s sleep, deciding exactly what it is that I want to eat, pottering around preparing the ingredients then sitting down to start the day. Sharing breakfast with loved ones is ideal, but a solitary bowl of bircher muesli or slice of homemade toast can be just as enjoyable: a good meal setting you up for an even better day. Recently there have been big campaigns for the latest convenience food: breakfast biscuits. For my American readers, I’m not talking about your soft, leavened quick breads (which I imagine make a rather lovely breakfast topped with jam or used to mop up eggs), but a hard, British biscuit (the kind of thing you might dunk in an afternoon cup of tea). They feel so completely soulless, not only in flavour and texture but in what they suggest about our twenty-first century society: that everything now needs to come in a packet, to be consumable on the go and filled full of sugar and syrup over any other more nutritious ingredient. The other day, as I was eating oats and blueberries for breakfast, I had the idea that the combination might taste rather delicious as a dessert. Blueberries aren’t yet in season so I rely on a stash in the freezer: sometimes they get defrosted but are often popped straight into milk or my mouth, melting like sweet little bombs of blueberry sorbet. I wanted to bake the oats into a biscuit to contrast with smooth, zingy blueberry, but rather than going down the pernicious breakfast biscuit route (sorry, I really do dislike those things) I decided to create a proper dessert. 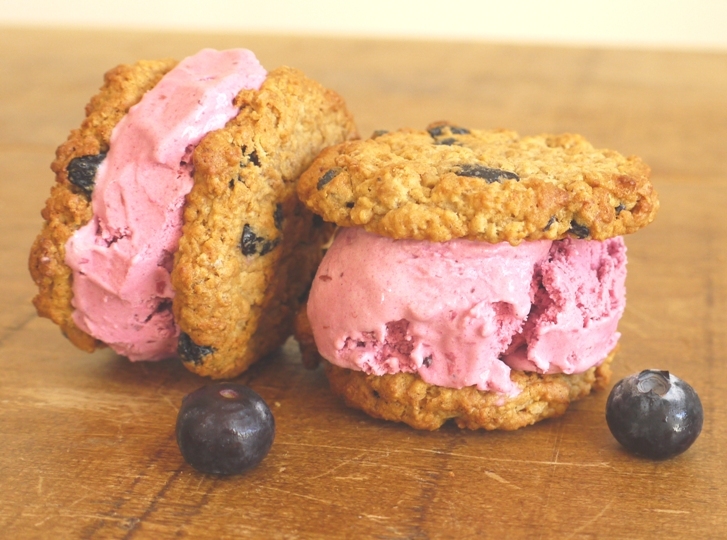 The result is these blueberry and oatmeal ice cream sandwiches. Blueberries appear twice in this recipe: dried then folded into the cookie dough and cooked down with a scant spoon of maple syrup before being blitzed into the most beautiful purple ice (along with thick creamy yoghurt and a little double cream). The cookies stay slightly soft so you can eat them as soon as the ice cream has softened, and the whole mouthful is at once sharp and sweet, smooth, chewy and absolutely divine. Perhaps because of the breakfast influence, this dessert isn’t overly sweet. The cookies have just a little unrefined sugar and honey, the ice cream sweetened with just enough brown rice syrup to allow the flavour of the fruit to shine through. In fact I’ll be as brave as to suggest that they’re no less healthy than the aforementioned breakfast biscuit, and certainly lacking in any of the nasty gums, syrups and stabilizers you’ll find in anything that comes out of a packet. I’m sure one day the multinationals will find a way to convince us that eating ice cream for breakfast is healthy. Until then, enjoy these as a simple little dessert. Or sneak one out the freezer at breakfast time, I promise not to tell . . . This recipe makes about 8 ice cream sandwiches. Depending on the size of your cookies, you may be left with a few leftover cookies or a little ice cream. Hopefully you’ll find that this is hardly a hardship. In a medium sized saucepan, heat the blueberries and maple syrup. Cook for around ten minutes, stirring occasionally, until the blueberries are soft and mushy. In a separate saucepan, heat the brown rice syrup and double cream over a medium heat until combined. Put the cooked blueberries, cream mixture, vanilla extract and yoghurt in a blender and pulse until combined. Chill in the fridge overnight then churn in an ice cream maker according to the manufacturer’s instructions. Transfer to a container and freeze until needed. Preheat the oven to 180 C. Line a large baking sheet with parchment paper. In a large bowl, cream together the butter and sugar together until soft, then beat in the honey. Add the egg and cinnamon powder and mix well. In a separate bowl, sift together the flour and baking powder then add the oats and dried blueberries. Add to the butter mixture. Drop heaped dessertspoonfuls of the dough onto the prepared baking sheet (it should make around 16 medium-sized cookies) and bake for 10-12 minutes or until lightly golden. They won’t spread much, but if you’re keen on a perfectly round shape, take the cookies out after about 5 minutes and guide into a round with a teaspoon. Remove them from the oven – the cookies should be golden but will still slightly soft to the touch. Leave the cookies to cool for a minute then transfer to a cooling rack to completely cool. Remove the ice cream from the freezer and allow to soften slightly, about 10 minutes. At the same time, place a large plate in the freezer to chill. 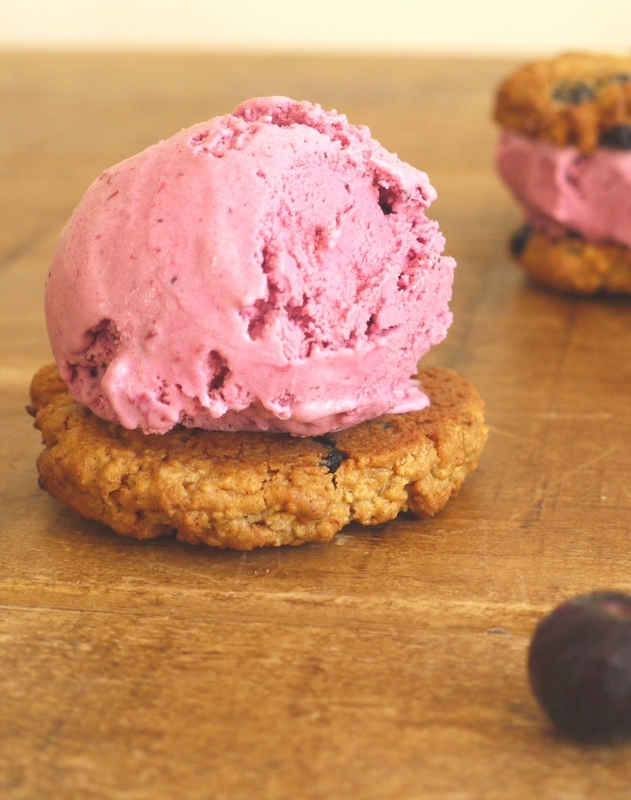 Using an ice cream scoop, place one scoop of blueberry ice cream on the underside of one cookie and top with a second cookie. Gently press down and smooth the outer edge flat with a palette knife. Place the sandwich on the plate in the freezer. Repeat until you’ve used up all your cookies. After about half an hour, when the sandwiches have frozen, wrap tightly in parchment paper. Remove from the freezer about 10 minutes before you want to eat. Gorgeous gorgeous gorgeous! Blueberries and oats are an almost daily feature of my diet but, as you say, usually at breakfast. I find ice cream sandwiches a bit weird – ice cream to me should go with something hot and soft, rather than cold and crunchy, but your photos are so pretty and the idea so inviting that I bet I’d love this! Also, I TOTALLY share your hatred of ‘breakfast biscuits’. I reckon a pack of those would keep me full for, oh, probably all of ten minutes. These look absolutely perfect. I really want ice cream now and it’s only 9:30am. I hate those bland breakfast biscuits. Surely we haven’t become so lazy that we can’t pour milk over cereal anymore. These sound amazing! I’ve got a husband craving ice cream and a toddler who currently only eats potatoes so these should please both camps, perfect! I also love the sensation of frozen blueberries melting on the tongue. This looks delicious! Did I hear you say I can eat this for breakfast? Because I totally want to! I love this ice cream. It’s light and not very sweet but pairs perfectly with the cookies. Love oats and blueberries and quite often have them for breakfast in the form of a big bowl of porridge, drizzled with honey and blueberries stirred through. Your cookies look amazing and the blueberry ice cream is such a pretty colour. The breakfast biscuits also annoy me, they don’t seem very substantial and I quite often rant at the adverts on TV for them! You make some of the best ice creams Kate! I recently bought rice syrup and of course only used it for my oatmeal, boring. The idea of sweetening lightly a fruit ice cream is so good. I don´t eat many homemade cookies but I love oats in every form, and oatmeal cookies are really amazing. I will put those dried blueberries to good use! Oh, these sound so much better than the traditional bland machine-produced chocolate and vanilla ice cream sandwiches! They’re almost like the San Francisco local version–the It’s It. But I’ve never seen an It’s It with blueberry ice cream! NOM. Love these! Oatmeal with blueberries is one of my favorite breakfasts and turning that into a dessert that involves ice cream… well that is just perfect! ah I think we are so similar. I can’t help but feel parallel when you talk about how much the sun influences you, and I agree 100 percent with this post here about breakfast and “nutrition” and the hype of our awful consumer-based health-food-world at the moment. These look divine, pure heaven. I love the combination of blueberries and oatmeal. Genius of you to pair them like this! Even if I don’t get the chance to make the whole double parts of these, I’m most definitely adding in dried blueberries into my next batch of oatmeal cookies. Looks fab, I am a big fan of pudding for breakfast, was just about to make granola but wonder if I should make these instead! Ooohh. These look so wonderful I love the beautiful purple colour of the ice cream! Bravo! I’m not much of a breakfast eater, but the idea of it in a sweet is perfect. What a great way to celebrate International oatmeal cookie day! 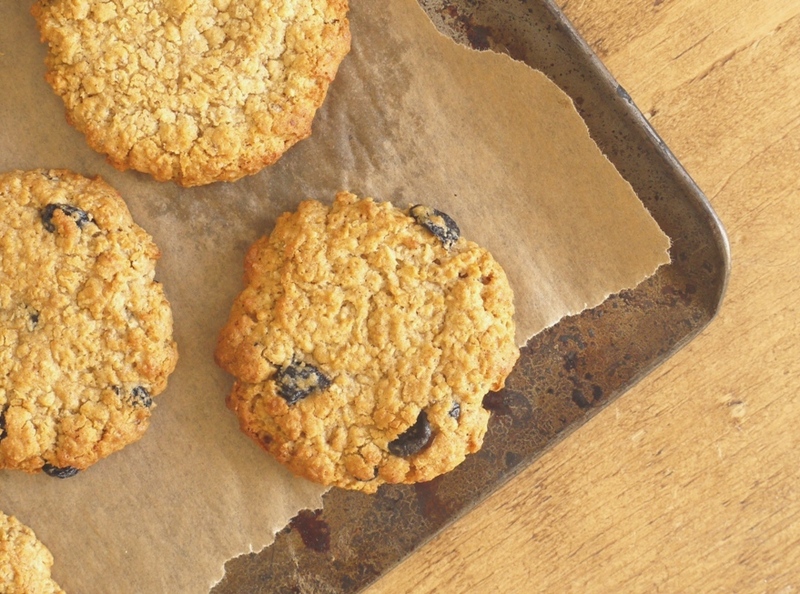 What an excellent recipe to celebrate International Oatmeal Cookie day! This is a great way to jazz up oatmeal cookies! These look absolutely perfect & I just love the vivid (yet totally natural) colour of that ice cream. Isn’t it gorgeous? Completely natural but it’s almost hard to believe! This looks so messy in the very best way. Oats and blueberry go so well together! I tried those breakfast biscuits you talk about and was completely unimpressed! they didn’t fill me up and just felt like a sugary treat before wanted to eat a real meal! these homemade ice cream sandwiches on the other hand look incredible! I like that you didn’t make the cookies too sweet, that’s what always overwhelms me halfway through an ice cream sandwich and then I usually have to give up and give the other half to Jeremy to finish. I can say with certainty that I’d be able to eat one of these whole. They look awesome!! I made these ice cream sandwiches pretty big but you could definitely reduce the size of the cookies to make them more manageable! And yes, they’re not too sweet which I really like. Wonderful double hit of blueberries in the cookies and the ice cream! 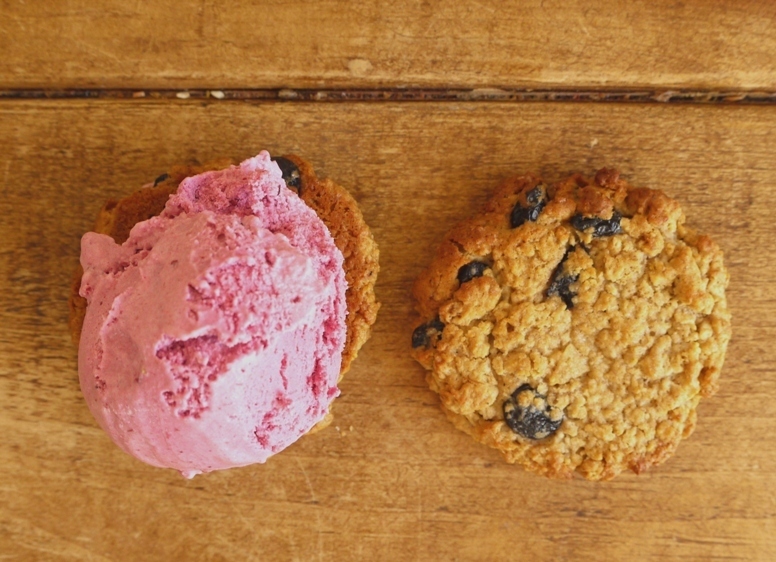 Pairing Blueberry Ice Cream with Oatmeal – Dried Blueberry cookies is more ‘Kate’ brilliance. Looks like I will have to get on this one tomorrow – for breakfast Sunday! That said..I totally agree about the rise of convenience foods and rock hard biscuits. I meant Blueberry Sorbet. It looks as rich and creamy as ice cream, hence the boo boo. Besides looking absolutely gorgeous (seriously, that color), these sandwiches sound so perfect and just what I want to eat this time of year. 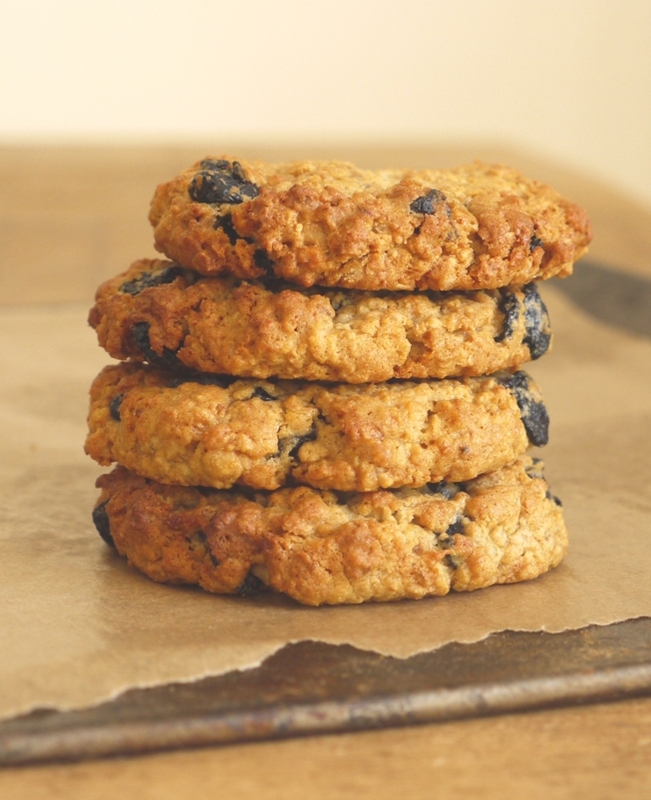 I love a good, oat-y cookie and making it a sandwich, with the flavors of breakfast is genius. So basically I have permission to eat ice cream for breakfast? Sold! These look delicious and I’m so making the ice cream – which, I’m thinking, with a little homemade granola sprinkled over the top definitely constitutes breakfast!